The highlight of the EVent as definitely the parade. 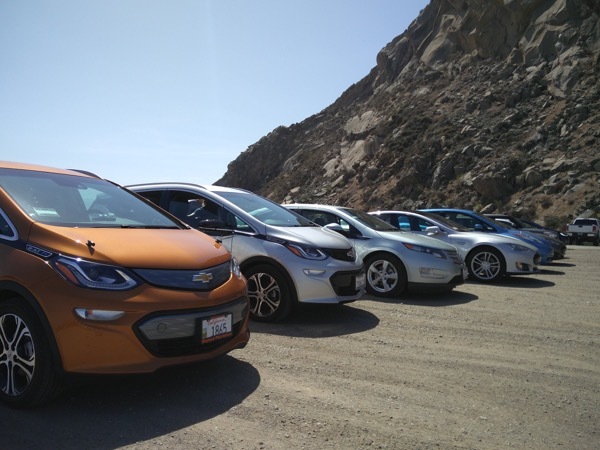 We had 12 EVs drive together from SLO to Morro Bay. We'll gather at 11:00am at the charging stations outside of the Target in San Luis Obispo at 11990 Los Osos Valley Road. The Mayor of San Luis Obispo, Heidi Harmon, has confirmed and will participate (she is an electric car driver and global climate warrior!) so we are fortunate to have her to say a few words. Also, Congressman Salud Carbajal has been contacted. After Heidi addresses the folks, we will take a great photo with the Mayor and our electric caravan! Then we depart West on Los Osos Valley Road and make a right onto Turri Road (a gorgeous drive) to South Bay Blvd. Right on SBB to Main Street and make a left (through Morro Bay State Park). Once through downtown Morro Bay, we go left to the monolithic Morro Rock for photo ops. Then it's back the way we come, ending at chargers of Home Depot on 1551 Froom Ranch Way, San Luis Obispo. Thanks for coming! Register by clicking the blue "register" button at the top of this page, and be entered to win a chance at a $250 gift card! This year our slogan is "Take it to the nearest star- solar rooftop & Electric Car". Questions that just can't wait? Call me at 805 540-8970 anytime! Ask for joey. Registered attendees report 389,600 electric miles driven.